Hello from snowy and cold Michigan. Cold weather has a tendency to make me think of comfort food and a desire to go in the kitchen and cook something warm and comforting. 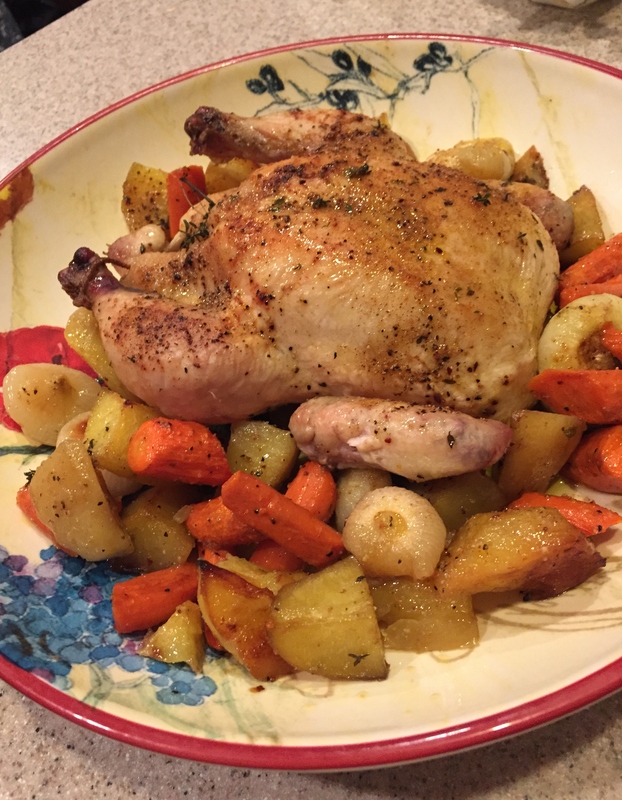 To me the classic comfort food is roast chicken. I think why I like this so much is we often had it as a Sunday Dinner when I was growing up. My Dad did all the cooking and he would prepare this for Sunday Dinner while the rest of us went to Church. No, he didn’t go to church but he was a good person anyway. So, it was nearly always roast chicken, mashed potatoes, gravy and his homemade yeast rolls for our Sunday dinner. He didn’t do the roast vegetables which I now prefer to mashed potatoes. But anyway, it was always a good meal back then. Chickens have been around for a long time. The ancient Egyptians liked to use the roosters for fighting and also developed a system for artificial incubation. Whereas, the ancient Greeks considered the chicken to be a delicacy and prestigious food. A really informative article on the history of chickens can be found here. Chicken can be cooked in so many ways, probably more so than any other food. It can be roasted, fried, braised, broiled, grilled or stewed. I like to use the whole small fryers for roasting. You can readily find them at the grocery store. If one is not enough, it is just as easy to cook two chickens at the same time. It was difficult to find historical references to roast chicken but I did find this short recipe which I will quote. Interesting. Right? 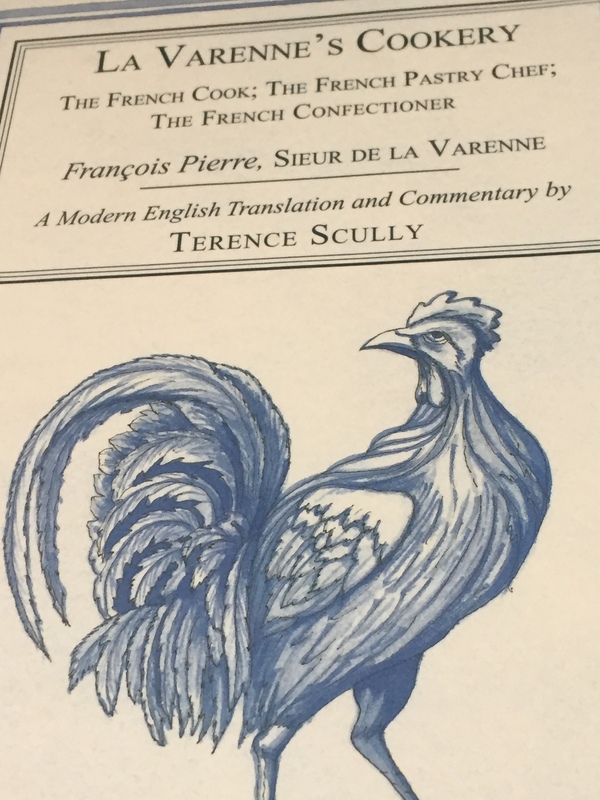 Above quoted recipe is from La Varenne’s Cookery (The French Cook), a cookbook that was first published in the mid 1600’s. Wash and peel the carrots, and cut into 2-inch pieces. Wash and peel the potatoes, and cut into 1 1/2-inch pieces. Peel the onions and leave whole if using the Cipollini onions. If using a larger kind of onion cut into chunks or wedges. Place all the cut vegetables in a single layer in a roasting pan. Drizzle them with some of the olive oil and sprinkle some of the salt, pepper, garlic powder and thyme on them. Toss well and position around the pan, leaving room in the center for the chicken. Place the chicken on a work surface or cutting board and pat it dry with paper towels. Cut off and discard any extra fat hanging around the body cavity. Brush some of the olive oil all over the chicken skin and season the outside of the chicken generously with some of the seasoned salt, pepper, and garlic powder. Place one of the onions, the garlic clove and 2-3 sprigs of thyme inside the cavity. Place the chicken breast-side up in the center of the vegetables in the roasting pan. Tie the legs together with kitchen string and tuck the wing tips under the body of the chicken. Roast the chicken in the preheated oven for approximately 1 hour and 30 minutes or until an instant read thermometer inserted into the thickest part of the thigh reads 165°. The skin should be brown and crisp and the vegetables tender. Let the chicken rest for approximately 30 minutes before carving and serving with the vegetables. 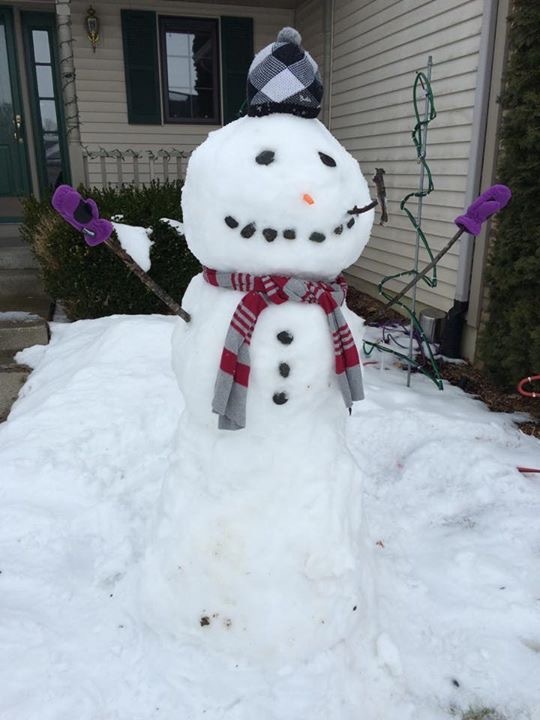 By the way, photo of Mr. Snowman is courtesy of a family member.